Welcome to E14 Arcade, where we’ll be recommending a few things you can pick up on the various downloadable content platforms across the various platforms. 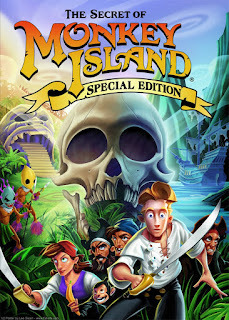 For those who’ve never played the original game, The Secret of Monkey Island is one of the old-school point and click adventure games that Lucasarts used to be so famous for before they focused their attention on trying to make as many awesome Star Wars games as possible. You can’t really fault the logic, can you? The Secret of Monkey Island, for those who've never played it, puts you in the shoes of Guybrush Threepwood, an aspiring pirate in the Caribbean. You begin your journey on Mêlée Island, where you begin to complete the necessary tasks to satisfy the local pirate scene in order to earn your stripes. Along the way you come across a devious and dastardly plot involving the mystical Monkey Island and a ghostly figure that is eager for your demise in order to complete his scheme. The game itself is one of the classic point and click adventure games, and deserves every bit of its classic status. The plot is engaging, the characters are interesting and often hilarious, and the puzzles are a good mix of sensible and farcical that will challenge even the most seasoned gamer. The reason this comes so highly recommended is simple: So often, games come out on Xbox Live Arcade, PSN or as a downloadable title on PC (via Steam, Popcap and the like), and they’re an old game. Fair enough, people like their old games fine. However, in most cases (particularly with the cases of the old SEGA Mega Drive games), the games haven’t been given any upgrade beyond the obvious HD upscaling. As a result, users can occasionally feel cheated if a game provides the same experience with no variety whatsoever (particularly if they were unfortunate enough to pick up Ecco the Dolphin). It’s refreshing to see, therefore, a game that’s been updated for the better without losing the charm that made so many people a fan of it in the first place. I’ll be putting some more of these up for older games in the library that you may have missed the first time round, in any case, so you’ll begin to see a pattern emerging before too long, but sufficed to say that an old game that has been re-released with something new will be much more highly recommended by us here at E14. Retro games have their place in the annals of history, but as gamers we have the right to expect a little more care and attention rather than spending out another £7-£15 (the top end of the arcade re-release price spectrum, in most cases) on twenty-year-old games that have had nothing added to them whatsoever. The game has been bumped up to full 3D character artwork, and has been upgraded to full voice-over, adding to the text-based interaction of the first game. What’s more, another feature that’s conspicuously absent from some games, if you REALLY don’t get along with the new 3D overlay, you can simply turn it off! What more could you possible ask for? All in all, a significant update to the original that’s well worth your purchase. 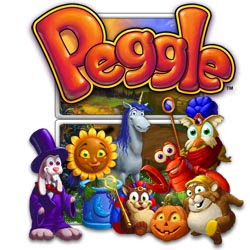 Originally released in 2007, Peggle was originally released for PC and has since seen fifty million downloads, and subsequent sequels, re-releases on other platforms and even a demonstration of sorts in The Orange Box and World of Warcraft . A victim of its own cutesy presentation, the game didn't sell well until its inclusion in The Orange Box as a ten-level sampler. Peggle is one of those games that shouldn't be as much fun as it is. It is possibly one of the least complex games I've ever had the good fortune to play. Essentially you simply press one button and then watch a ball travel down a board, lighting up pegs. Your objective in the game is to clear the board of the 25 orange pegs scattered around in patterns. Sounds simple? Absolutely. Sounds boring? Maybe it sounds boring, but I can assure you it's anything but. Peggle is one of those things that is difficult to explain without actually allowing you to play it, but rest assured that once you've played Peggle you won't regret it. There is also a tremendous amount of value involved with the purchase of Peggle as well. Not only do you get the full game and what's known as "Adventure" mode, a series of 50 levels over 10 stages, you also get some challenge modes, a master duel mode where you face off against an AI opponent and Quick Play mode allowing you to play one level whenever takes your fancy. Trust me, that'll be often. As if all that wasn't enough, those lucky enough to have Xbox Live versions of the game will be able to play multiplayer online as well. For 800 Microsoft Points, you can't really go wrong there. Stay tuned to E14 Arcade, where over the next few editions we will be exploring all that the DLC platforms have to offer, as well as rating the first three pieces of downloadable content for Fallout 3!